A Fox .15 and a Ring Master Jr. go together like bacon and eggs . The old green head K&B .15 is another good choice . Their counter part .19's make the Jr. a rocket and the .09's a slug . The Tee Dee .09 should pull it around like the .15's . My choice is the Fox .15 X with out a muffler . The planes look great guys , get them finished and flying . We need action pictures!! Thanks for the comments. It will be unmuffled for sure. When I get it finished and flying, I will try my best to get a few action shots. First though is I gotta get the engine running. IF the weather ever breaks here, I will be starting to work in the garage and running the engine there. ar Chancey i hope the engine runs out good for you so ya can move on . days coming !! Thanks Eric. Yep, still cold, windy and lightly snowing here. I can't wait to see teh sun again. The last time I saw it was last week in Las Vegas. And even then, there was not a whole lot of it there as I am used to. NEW222 wrote: Thanks Eric. Yep, still cold, windy and lightly snowing here. I can't wait to see teh sun again. The last time I saw it was last week in Las Vegas. And even then, there was not a whole lot of it there as I am used to. Hey Chancey, I'm sending you some mild-weather. You should get it in a day or two. Make sure you're prepared.. because I can't guarantee how long it will last in a Canadian-Spring.. You may only have a small-window to work with.. so you need to be ready. My S-5 had been built as-per the Sterling-plans and covered (by me..) with TF/Monokote years ago. It's been hangar'd for decades since being covered. I could strip the covering.. and re-glue all the joints.. but I'm not going to do that. The framework has aged Ambroid-cement construction. "Ambroid" model-cement was the standard "glue" in the 1950's for aero-modelers. It would be pointless to discuss modern compatible cellulose-adhesives.. as there likely aren't any marketed for our hobby. "You" have the advantage of building a vintage-model.. with a clean-slate. Roddie, the only concern I would have is the bellcrank. Slide a piece of music wire through your leadout terminations and give it a good pull. Listen for cracking and watch for flexing. Just remember this is a .15 size plane and not a .60 so no need to debone the wing. The JR and the .35 used only single platform bellcrank attachments. If Ambroid was used for the plywood joint ( It was never intended for ply) it certainly would be the sacrificial element in the system. If I have to access this area through the sheeting, I mark out a nice square and use a straightedge to cut it out. Don't plunge your knife straight in. Hold the knife at a 45 deg angle all the way around the cut. By doing so, you can glue the piece directly back in without adding additional wood. I've done an S-1, a Jr. and a Yak 9 restoration. All of them looked like something out of a prison workshop or an unsupervised Cub Scout den when I started. Believe me; there is no substitute for removing the entire top side of wing center sheeting. I see a problem, do you??????? Ok. So, I do not know what I was thinking! So this past week, I was very happy to install the wing into my Ringmaster Jr. It all went very well. Last night, I even sanded it to get it ready for paint I was so happy. Then today while cleaning up / organizing teh mess in my model room, I looked at it again. Something was definately wrong, but what was it? I look the plane over again and could not see anything, but my gut told me otherwise. So on I go about tidying up then I see a wheel on my workbench. Put it away then think, 'hey, isn't this for my Ringmaster Jr? No, there's no gear on it. Wait a minute.... Just back things up a second.... Go grab the box, and open it. Yep, teh landing gear I fought with to both find and make was laying in the box. Problem is that it was supposed to be installed BEFORE the wing! So now I got this problem on my hands here. I really want landing gear on it so I can launch it if by myself. What are my current options to remedy this? I need help please. I looked at making a hole in teh fuselage, but was unsure of how big it would have to be. 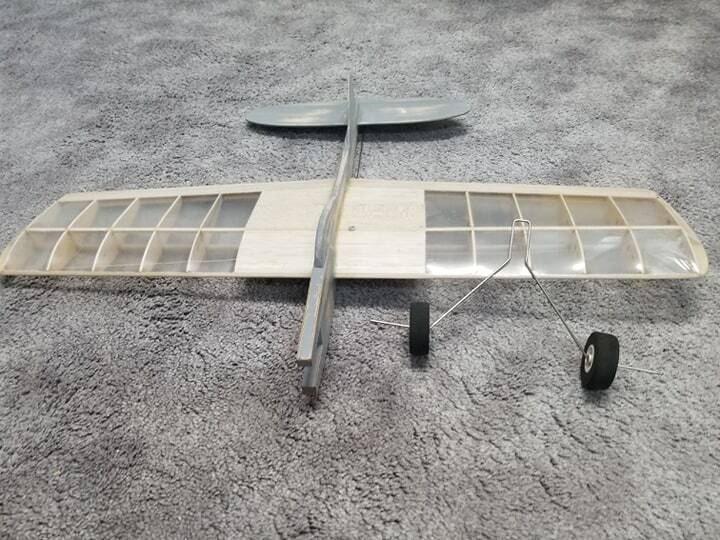 Glad we had a mini snowstorm this morning and a lot of wind to keep it cool as I was going to start painting, but will now postpone until I figure out the landing gear situation. Would cutting the gear in the center be safe to do then drill a hole and install a brass tube in the fuselage for teh ends to slide into? It is the easiest and quickest solution I can think of. I know some gear is installed this way, and I would not have to modify anything. When you do that, make certain you use 2 gear straps. One as low as you can place it on the fuse and the other as high. I also like to chamfer the hole with the tubing using a countersink as this allows some of the tight radius to nestle in. A single gear strap will eventually fail and the gear usually bends from using one pulling out of the tubing where it enters it. I like to install a smallish piece of Hardwood square into the fuse and drill a hole though that for the gear. Balsa alone will allow the brass tube to flex and eventually break and the gear becomes wobbly. Well, thanks for confirming this with work-around solutions. I will then pick up a couple more straps as I only had the two I originally used in test fitting. Also, thanks for the hardwood idea, I will look to see where it is mounted, but I do believe in the plywood, and if not, I have some dowel I can drill and install. Ken is quite right about the cost (time and sometimes money) effective angle on rebuilds. Bob and I are just a little eccentric when it comes to that aspect though. I guess when you get right down to it, you could win a stunt contest with an electric powered plug and play Nobler ARF.